Protective all-weather cover for your umbrella. Protect your patio umbrella with this Cantilever Cover. Its heavyweight GardelleTM polyester fabric has a special water-repellent undercoating and protective dark-splash guard skirt to keep your umbrella in pristine condition. The straps snap-close over the legs to secure it even on the windiest of days. Cinch it tight using the elastic hem cord with toggle. Classic Accessories Cantilever Umbrella Cover is rated 4.5 out of 5 by 55. Rated 5 out of 5 by Joansie from Umbrella Cover Just got the cover. Good sturdy material. Fits my 8 Foot umbrella . Rated 4 out of 5 by onovtec from Fantastic Quality overall amazing quality, I do echo other comments related to design, a thin rod or something to allow you to put on the umbrella cover easier as my umbrella is very tall, a bit better design where the drawstring didn't have to go all the way from the top in order to secure the umbrella. maybe instead high quality belt \ buckle set up, allowing it to be fully opened up and then can tighten it as much as needed. really though, this is the best quality cover you can buy. others deteriorate in just one summer south sun, this one should go for a few years anyway. Rated 5 out of 5 by ss1234 from great product very stylish, comes with amazing warranty! Rated 5 out of 5 by sb1234 from amazing product and its large! its large enough to cover very large umbrella, the service is amazing in terms of warranty. it rip a bit and they replaced it right away and i got it deliver fast! amazing service and warranty. 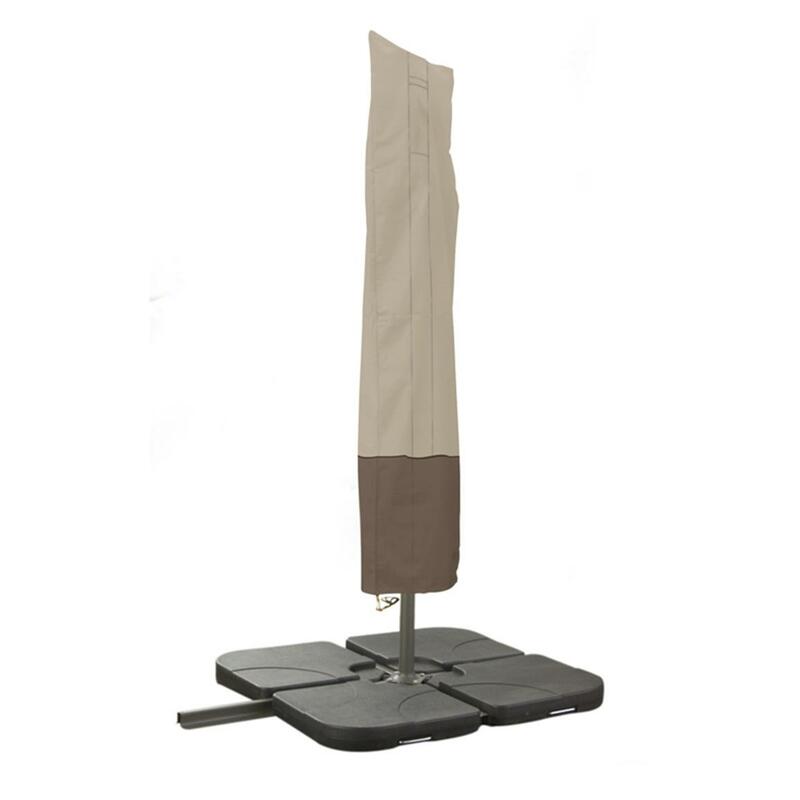 Rated 5 out of 5 by Tomldtx from Fits an 11' market umbrella perfectly 11' market umbrella is pretty large and not practical to take in garage whenever not in use. This cover fits perfectly and if it holds up will really make enjoying the patio much easier. Looks great and seems to be a good quality for a very reasonable price. Rated 4 out of 5 by Mike from Only two drawbacks, otherwise, a very good cover Other reviews have mentioned similar products that have a rod running up the length of the cover for easier covering and removal. I happen to have an adjustable-length extension rod from a bulb-changing kit that I use instead. Works just fine, although it gets a bit awkward at times. One of the reasons for this awkwardness: There is a big design flaw whereby the drawstring at the bottom requires the cover to be lifted ALL THE WAY UP before the cover can be completely removed, even with the zipper fully unzipped. I solved this by cutting the drawstring. In this way, as soon as the top of the cover raises high enough for the unzipped zipper to clear the top of the umbrella, I can move the cover sideways so it comes off. The loss of the drawstring does not impact the ability of the cover to stay put in high winds. I just bought 4 more Classic Accessories Veranda covers for my new patio furniture and noticed that after only 5 months, the umbrella cover had faded significantly. Hopefully that will not affect the waterproofing. Roof height at crossbeam: 6'4"
A great-price on a premium-quality Gazebo.